National Charter Bus books a variety of charter bus types events of every kind in Austin, Texas. Contact our 24-hour team at 512-546-6019 to learn more about bus rental prices, availability, and more! 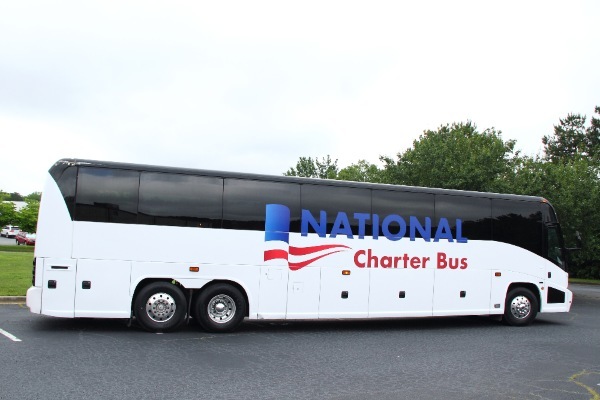 National Charter Bus is an industry-leading charter bus and minibus reservation service, booking the safest, most efficient luxury coaches available to our customers. Texas’s state capital deserves the best service in the industry, and that’s what National Charter Bus brings to every trip. We’ve worked long and hard to develop a team of agents, drivers, and partners, whom we rely on every day for professional, complimentary service. Every time you call in, you speak to a reservation agent who takes the time to gather your information and hand select a driver that best knows your area. From there, a premium coach fitted with most exclusive amenities (such as WiFi, reclining seats, and power outlets) is booked for your journey, and you’re sent a simple itinerary to confirm your trip. Ready to know what it feels like to get national-caliber service from a locally-grown company? Speak to a reservation agent today at 512-546-6019 to get a free quote and book your next trip. It’s easy to get disorganized and off-track when transporting large groups of people. When your group has to rely on public transportation, carpooling, or rideshare apps, it can lead to late arrivals and the potential for your event to get off-schedule. If you’re planning a large-scale event, like a corporate event, wedding, sports tournament, or more, a charter bus rental is the best way to shuttle attendees to ensure punctuality and organization. Your attendees won’t have to worry about navigation, traffic, or parking on their way to The Allan House, the Phillips Event Center, or any other event venue. Your driver will make sure everyone arrives safely and on-time for a seamless event. National Charter Bus prioritizes safety and comfort, which is why so many schools and church groups choose to work with us. We only work with professional, licensed bus providers and drivers we trust to ensure your trip remains safe and reliable from start to finish. Children and chaperones love the comfort of a charter bus rental. Old, traditional school buses don’t have top-tier amenities that a coach rental offers, such as on-board restrooms, air conditioning, TVs with DVD players, a radio system, WiFi, and more. Ride to the Austin Zoo in complete comfort without the need for unnecessary restroom stops and with the opportunity to bond with your group. Nothing beats the beautiful country hillside of Austin. Enjoy the gorgeous scenery at Ziker Park without the worry of how you’re going to get there. Store luggage, hiking gear, picnic materials, and more in your bus’s ample storage space, and know your personal belongings will remain safe while you’re out adventuring. Your trip to Austin is entirely up to you when you partner with National Charter Bus. Plan the ultimate sightseeing tour in Texas’s capital-- you have complete freedom with your personal charter bus rental. 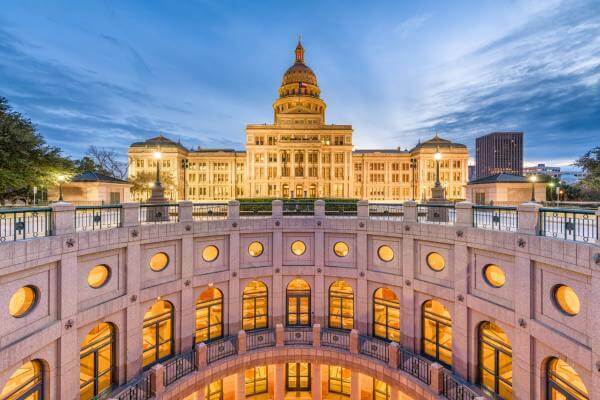 Explore the Texas State Capitol, the Bullock Texas State History Museum, Museum of the Weird, and much more without the hassles of finding them on your own. Discovering the best of Austin is easy-- just build your own itinerary, and we’ll handle the rest. Charter bus rentals have never been easier when you work with National Charter Bus. Our 24/7 support and extensive network of bus rentals ensure your trip will run seamlessly the whole ride. Want to learn more? Call us anytime at 512-546-6019. 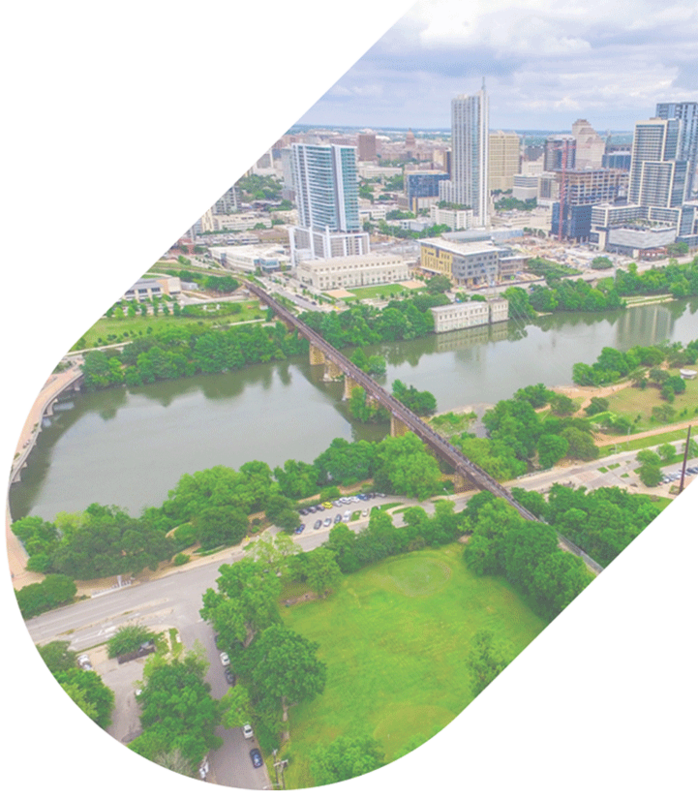 Group trips to Austin can be a lot of fun, especially when you’ve got a big group of friends or family members to travel with; what’s not so fun is planning transportation for a large number of people. National Charter Bus makes it easy to schedule seamless group transportation to all Austin destinations, no matter what you’re traveling for. For a free quote on the best group travel options, call us today at 512-548-6019! Austin is known for its eclectic museums and art galleries, world-class barbecue, unbeatable live music venues, and some of the best opportunities to enjoy the outdoors. Though you can’t truly experience all of the city’s best in one trip, there are a few stops you won’t want to miss. Below, we’ve listed some of our top choices, essential for any trip to Austin. Though Capital Metro and rideshare services are available in Austin, they can make it difficult to remain organized when you’re traveling with a group. Public transportation runs on fixed schedules and can easily separate your group, while rideshare apps can only carry a few group members at one time. National Charter Bus books buses in a variety of sizes to help streamline group transportation in Austin for groups of all types. We charter minibuses capable of holding as few as 18 passengers, full-sized charter buses designed to hold up to 56 passengers, and sizes in-between such as our 20- and 25-passenger minibus models to comfortably accommodate any group. When you book a bus, you can choose from premium amenities such as air conditioning for the intense Texas heat, entertainment add-ons, WiFi, reclining seats, panoramic windows, and even on-board restrooms for long trips. You’ll also be paired with a professional driver who will ensure that your group travels effortlessly to all of your Austin destinations. Your personal bus will help streamline all of your group’s transportation throughout your trip. Whether you’re in town for a wedding, taking your students on a field trip, traveling with family & friends, attending a corporate convention, or even planning an outing for your retirement community, we’ve got everything you need to transport your group with ease. Known officially as the “Live Music Capital of the World,” you can’t come to Austin without witnessing at least one live show. Thanks to influencers such as Willie Nelson and Townes Van Zandt, Austin’s club scene began to grow rapidly in the ‘70s and ‘80s, planting the seeds for what would later become the American city with the most live music venues per capita. Festivals such as the annual SXSW music festival also help to keep the city’s music scene alive. Whether you’re coming in just for the night or you’re planning to stay for a while, National Charter Bus will make sure that you’re secured reliable transportation to however many live shows you plan to see in Austin. Stay out for as long as you’d like-- your driver will be available to transport you to different venues and bring you back to your hotel when the night’s wrapping up. Known unofficially for the phrase “Keep Austin Weird,” the town is home to eclectic art collections, museums filled with oddities, graffiti showcases, and more. Many of these off-the-wall places are run by locals who are committed to keeping true to Austin’s roots, making sure to live every day by the city’s most popular phrase. Don’t leave Austin without throwing a few of these unique stops into your itinerary. We’ll work with you to finalize your plans and handle all transportation logistics so you can focus on all of the truly unique oddities that keep Austin weird. Austin is an outdoor lover’s paradise, with multiple rivers, lakes, parks, and the nearby Texas Hill Country at your disposal. The overall pleasant weather and ample opportunities to enjoy the outdoors make this a perfect destination for those who love to hike, bike, run, kayak, and enjoy the sun. If you’re heading in for more than just time outside, we’ll make sure your itinerary progresses on schedule so that you can soak up the sun and make it back to your convention, meeting, family reunion, or other Austin event without missing a beat. The most famous Austin nightlife spots can be found down Sixth Street, often compared to New Orleans’s Bourbon Street and known affectionately as “Dirty Sixth” by locals and visitors alike. While there’s certainly nothing wrong with this particular stretch, many locals would recommend branching out to experience some of Austin’s best nightlife. While you’re out with your friends, we’ll be your DD so that everyone can celebrate without worrying about how they’ll get home. Your driver will safely transport you to each stop and make sure that everyone returns to your hotel when the night’s wrapping up. Make sure the kids in your group are able to enjoy their trip to Austin as well with these kid-friendly attractions. Here, you’ll find plenty of opportunities to get your kids outside, teach them something new about the world around them, and encourage them to try new things. Between stops, kids will stay entertained with WiFi, power outlets, and televisions with DVD players on your bus, ensuring a stress-free trip for everyone. Known for its take on Texas barbecue, some would go so far as to say that Austin is the “Barbecue capital of the state,” though we’ll leave it up to you to verify that distinction for yourself. While you’re planning your trip, don’t forget to plan enough time for essential food and drink breaks-- and with the myriad of barbecue to be found in Austin, you won’t want to miss out on any opportunities to taste local brisket, ribs, sausage, coleslaw, potato salad, and more. Not in the mood for this classic southern cuisine? Add to your itinerary instead a few Tex-Mex restaurants, another Austin specialty. You’ll also find plenty of food trucks sprinkled throughout the city, offering all types of cuisines. After each meal, your driver will be ready to transport your group to your next attraction or back to your hotel for a satisfying post-meal nap. Whether you’re looking for something swanky and luxurious or down-home and cozy, Austin offers plenty of hotel choices to satisfy any traveler. We’ll keep your hotel connected to nearby convention centers, attractions, parks, restaurants, and more, making it easy to keep your entire group moving smoothly during the day, no matter what your itinerary has in store. Ready to finalize your trip plans? Call National Charter Bus at 512-546-6019 to speak to one of our 24-hour reservation specialists and receive your free, no-obligation quote. Trust us to find the best bus for your group at the best possible rate. We’re always happy to help organize your trip logistics and make your Austin trip unforgettable!